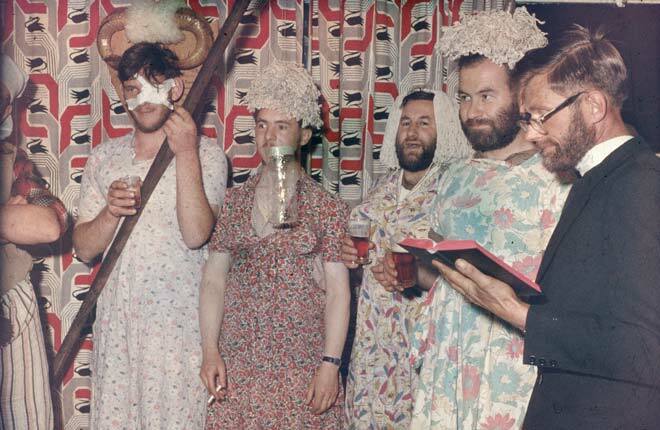 A group of men isolated on Campbell Island for a year, the weather-station staff had to make their own fun. Here ‘Campbell Choral’ dress up in rags from the cleaning bag and sing. They are (from left) carpenter Doug Herkt (with a genuine eye injury), meteorological observer Bob Lamb, cook Bob Rae, senior ionosphere observer Bob Thompson and leader George Poppleton.